I've been fascinated with the Antarctic ever since I read the real life adventure book "South!" by Sir Ernest Shackleton. It tells the story of Shackleton's ill-begotten expedition to the South Pole in 1914, and if you have never read it you should, because it will fill you with awe at what we humans are capable of... After the expedition's ship, the Endurance, got caught in the icepack and was slowly ground to toothpicks, Shackleton and his men somehow found a way to survive on the ice for two years with virtually no hope of rescue. In the end, all the dogs died, and more than a few penguins ended up being served for dinner, but not a single man was lost. Of course, the book would have been much shorter if Shackleton and his men had come across the secret Antarctic UFO base. Then again, they might not have survived the encounter, in which case there wouldn't have been a book at all. It would have to wait until WWII, when Admiral Byrd of the U.S. Navy led 4,000 Allied troops to Antarctica in what was known as "Operation Highjump" that the UFOs at the South Pole became a thing. 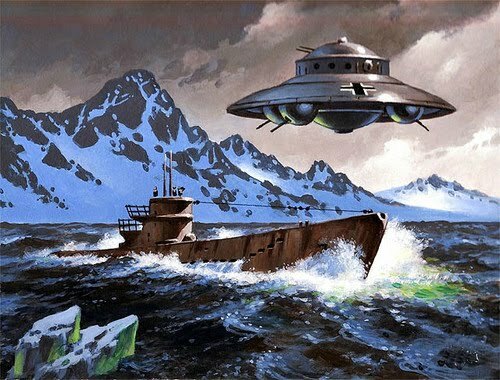 Byrd, who was sent to "invade" Antarctica, allegedly encountered mysterious flying craft that are surrounded by mystery even today. What a story! It's got everything: War! Nazis! Aliens! U-boats! Secret bases! UFOs! And. at the heart of the legend, the central mystery: were the flying ships piloted by Nazis, or aliens? No one knows for sure, but I can tell you one thing: in 4 months' time, we may all know. Why do I say this? Well, my Dad, who turns 90 this November 15th and who has in his lifetime visited 6 of the 7 continents, decided last week to go visit Antarctica this December, and to take me and four of my siblings along for the ride. My sister and brothers and I are still in disbelief. It had been a long-running conversation in the family that someday we would take Dad to Antarctica so that he could fulfill his dream of reaching every continent, but it always seemed pretty unattainable, for all the usual reasons: money; time; etc. Then out of the blue Dad decided to take us instead! Pretty cool guy, that Dad of mine. Wait: the Nazis were working with the aliens and they still lost the war? The point is, who has ever had the sheer, unmitigated audacity to head to the South Pole to investigate this story in the field? Has anyone ever before in the history of UFOlogy been bold enough to have their Dad take them to Antarctica so they could boldly investigate Byrd's story? I think not. Not Vallee. Not Hynek. Not Redfern. Not Dolan. Not Carey. Not Greer. Not even Adam Dew. Once again, I'm scooping them all. Who knows? Maybe a year from now I'll be renting out the national auditorium in Mexico City to unveil a smoking gun of my own. Maybe I won't even charge you anything. Congratulations to you and your family especially your dad for a fascinating trip. It should be a great experience for all. The Highjump story is interesting but IMO a work of fiction. The ships that were allegedly sunk were not listed in any of the official reports as even being involved in the expedition. Byrd's alleged quote in the Chilean newspaper wasn't what it's said it was. There would be someone who lost a family member that would have talked etc. etc. I'm guessing that you are not quite serious here but it's probably not a good idea to put a deposit on that space in Mexico City. Hi Mark, just heard you on Podcast Ufo. I'm from milwaukee and can't believe I missed the paracon! I'm hoping to catch 2016. If you want to head down the rabbit hole with Antarctica, may I suggest looking into the flat earth theories that have currently made a comeback. Flat earth?? So we could go over the edge??? Naw man, you'd hit the ice wall! The Curse of "Ancient Aliens"